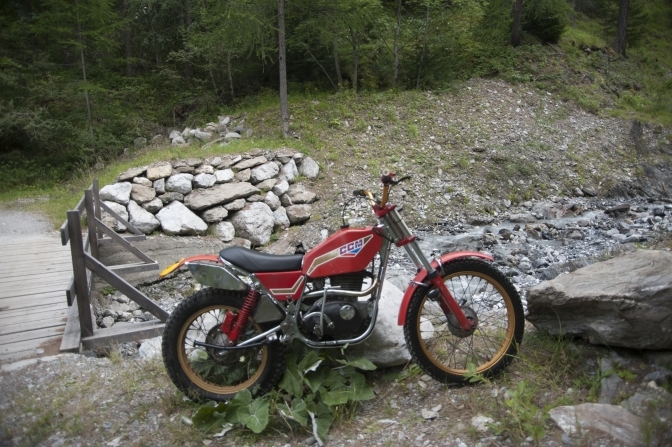 Another test from the Norek's this time the last British four stroke trials bike. 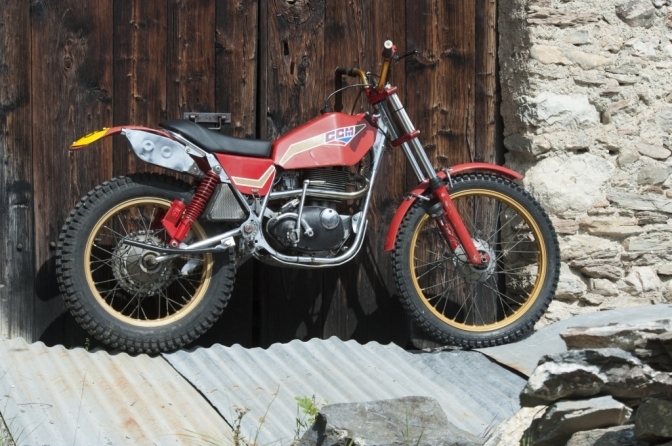 British 350 CCM trials bike Test. 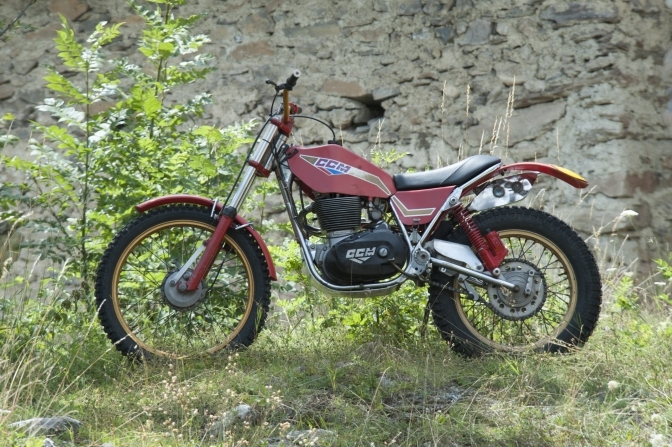 Alan Clews 350 BSA inspired "Clews Competition Motorcycles" trials bike. Justyn Norek Jr Tests a CCM,350 Trials. CCM 35O TRIALS BIKE IS VERY COMPACT. SO ENGINE SEEMS TO BE RATHER BIG. GUZZI "BARTORILLA" SPECIAL, ALSO TESTED BEFORE FOR YOU. AS BARTORILLA IS PERFECTIONIST IN EVERYTHING, I EXPECTED BIKE WILL START WITH FIRST PROD AND INDEED IT DID. FEW MINUTES TO WARM IT UP AND PIPPO DID SOME ROUNDS WITH HIS JEWEL THAN GIVING HANDLEBARS TO ME. I DID CAREFULLY SEVERAL ROUNDS TOO LEARNING FEELING OF THE MACHINE AS IT WAS FAIRLY DIFFERENT TO WHAT I AM RIDING NORMALLY MONTESA 4RT! IT WAS VERY MANOUVRABLE AND I COULD DO TIGHT CORNERS AND FEEL GOOD BALANCE.BUT IT WAS ON EASY TERRAI SO LETS GO NOW INTO ROCKY RIVERBED. 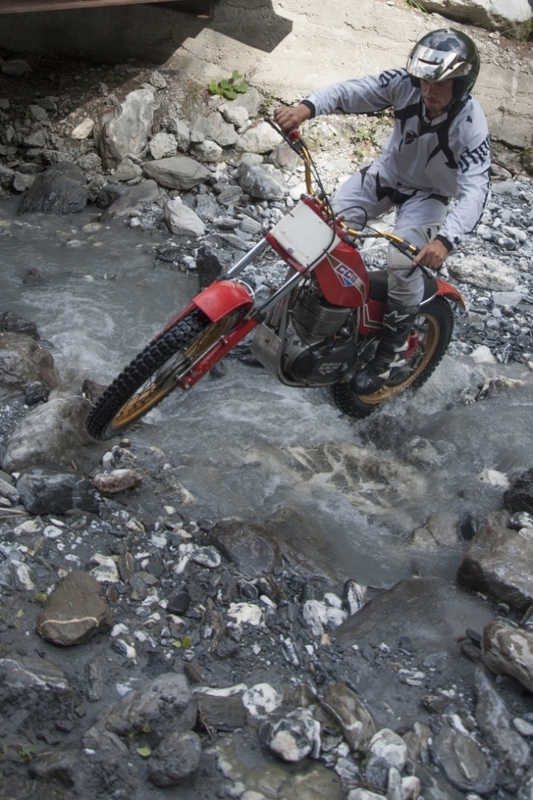 I MADE CAREFULLY DECENT AND PUT THE BIKE THROUGH STONY STREAM. DESPITE I KNOW THE PLACE IT HAS CHANGED AFTER RECENT RAIN SO SOON I FOUND DIFFICULTY WITH SOME BIG STONES, AND WHEN THE BIKE STOPS LOT OF TROUBLE IS TO START IT AGAIN, AND DEINITELY ITS HEAVY AND TALL BY TODAY STANDARDS I AM USED TO. BUT SLOWLY I GET USED TO MACHINE WORKING MORE WITH GAS THAN CLUTCH AS I AM USED TO. ENGINE IS VERY SOFT AND TAKING YOU OFF THE TROUBLE WITH IT'S LOWER REVS TORQUE. SO AFTER INITIAL TROUBLE I STARTED TO ENJOY RIDING IT OVER VARIOUS OBSTACLES. ANYWAY I PUT FEET TO GROUND MORE OFTEN THAN EXPECTED, IT'S NOT AN EASY BIKE TO RIDE OVER THE ROCKS DUE TO ITS WEIGHT. 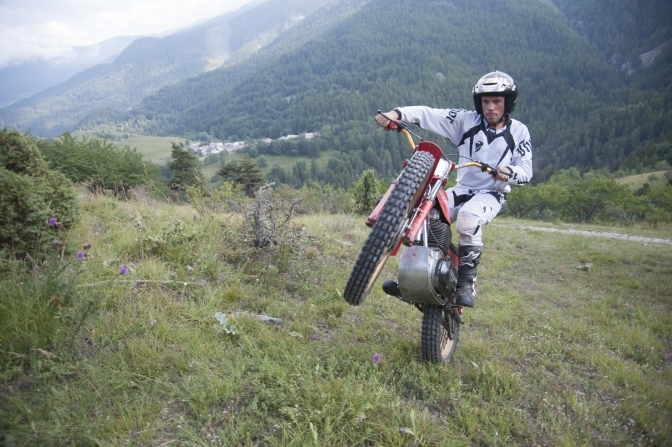 THAT WE CHANGED LOCATION HAVING RIDES UPHILL AND DOWNHILL AND WITH ENGINES TORQUE LONG WHEELIES ARE SHEER PLEASURE. 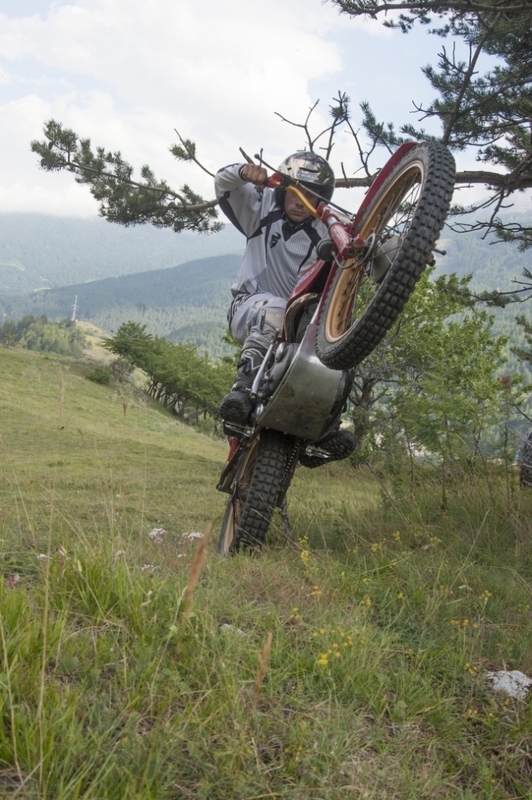 HOWEVER IT WAS HARD WORK, MUCH HARDER THAN OTHER TEST OF BARTORILLA MOTO GUZZI 250, THAT I STILL PREFER. CCM 350 TRIALS DESIGN HIGHLIGHTS: CCM IS BEAUTIFULL MACHINE AND IT HAS SEVERAL INTERESTING DESIGN SOLUTIONS, I WOULD LIKE TO MENTION FEW: ENGINE BEAUTIFUL AS BSA WAS WITH RIGHT COVER OF CRANKCASE WITH CCM LOGO IN RELIEF, FUEL TANK IN ALUMINIUM PARTICULAR SQUARISH SHAPE, MAY BE INSPIRED BY PETE JERRED HONDAS, PARTIALLY COVERING ENGINES HEAD MAKING BIKE LOOK LOWER, BEAUTIFULLY HANDCRAFTED FRAME IN CHROMED REYNOLDS 531 TUBING, CHAIN LENGTH ADJUSTMENT ECCENTRIC TYPE AT THE SPINDLY OF SWING ARM (WHO HAS DONE IT FIRST ? ), NICE STYLED AND COMFORTABLE SEAT PERFECTLY MATCHING REAR FRAME LOOP WITH SEAT BASE IN FIBERGLASS, INTERESTING SILENCER WORKING VERY WELL WITH ANTI-VIBRATION RIBS,MAGNESIUM FRONT FORKS, PLASTIC UNBREAKABLE PRESTON PETTY MUDGUARDS,DUE TO ITS RARITY, VERY MUCH SOUGHT AFTER AND EXPENSIVE, KIND OF CULT BIKE DESPITE DIDNT ACHIEVE MUCH COMPETITION SUCCESS.... WANTED!!! 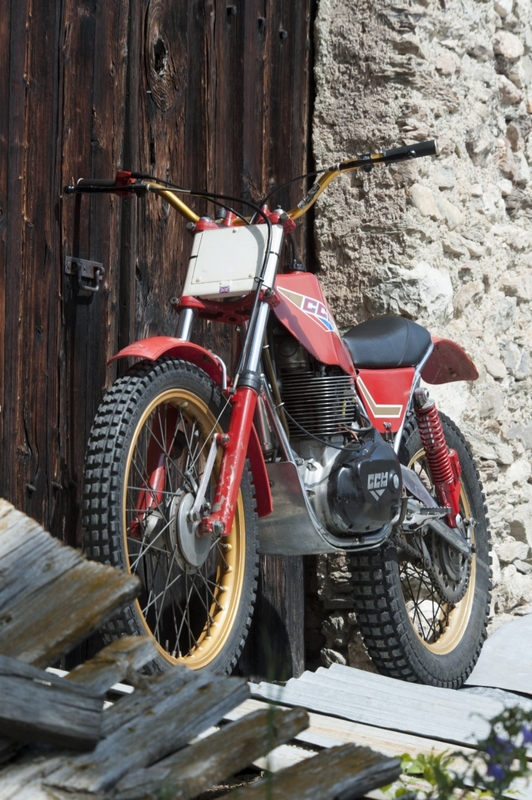 CCM 350 TRIALS 4 STROKE! 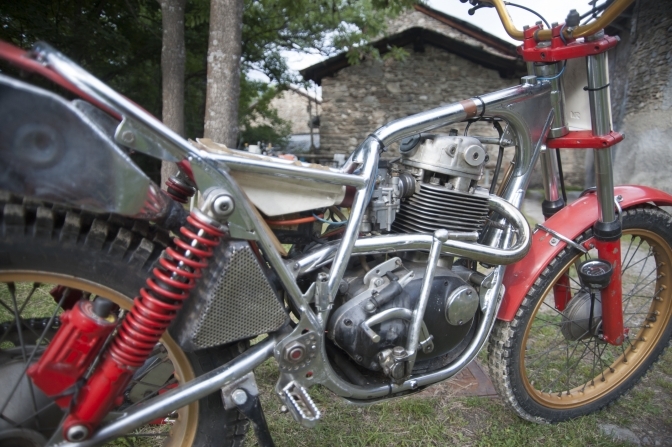 Front on shot showing the Marzocchi front forks, and Grimeca front hub, wheel rims used were from the CCM scrambles bikes. And a better shot from the other side showing the components better. Glass fibre work and fuel tank, very much on the lines of the Pete Jerred inspired Hondas. Mike Mills was working for CCM so is this where the styling came from? Justyn enjoying the ride through a Alps mountain stream. Justyn and the proud owner of the CCMPippo pose with the machine for the photographer Justyn Senior. 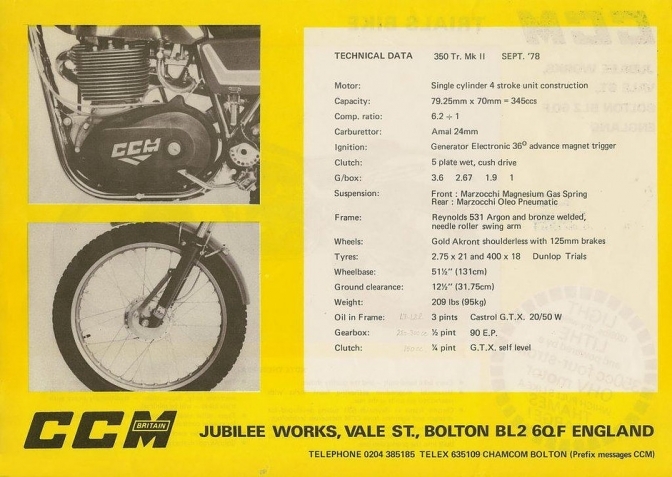 SOME HISTORY OF CCM TRIALS 350 4 STROKE. 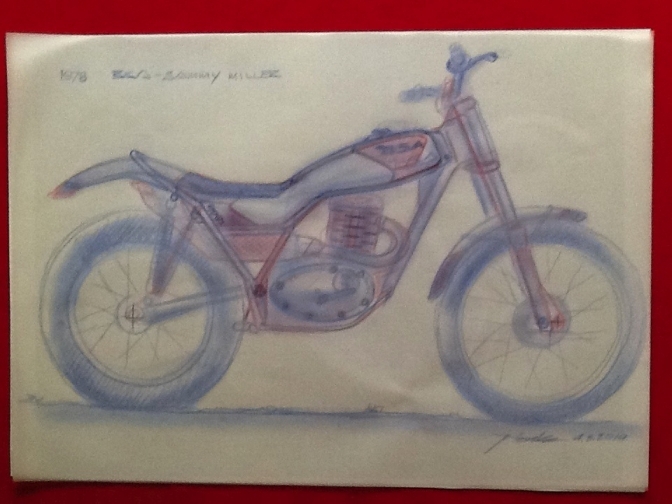 HAVING "KILLED" BIG FOUR STROKE TRIALS BIKES WITH HIS REVOLUTIONARY BULTACO TWOSTROKE PROJECT AND AFTER RE-LAUNCHING FOUR STROKE TRIALS BIKES AGAIN WITH HIS HONDA PROJECT, SAMMY MILLER AGAIN ARISED HOPES OF ALL FOURSTROKE TRIALS BIKES FANS, ONLY TO DISCOVER THAT SAMMY PARTED COMPANY WITH HONDA. TO SUPPLY HIM BSA ENGINES. UNFORTUNATELY ALAN CLEWS TURNED DOWN REQUEST THINKING ABOUT MAKING 4 STROKE TRIALS BIKE HIMSELF. 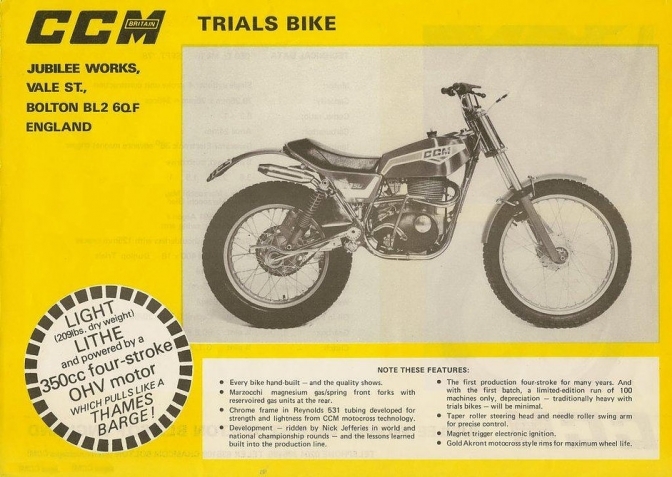 IN THE MEANTIME CLEWS STARTED HIS CCM TRIALS PROJECT WITH HELP OF NICK JEFFERIES EXPERIENCE ON HONDA TRIALS BIKE. NICK'S HONDA WAS INSPIRATION AS WELL AS Its MEASURES HELP TO START NEW BIKE, RATHER THEN START FROM WHITE PIECE OF PAPER. 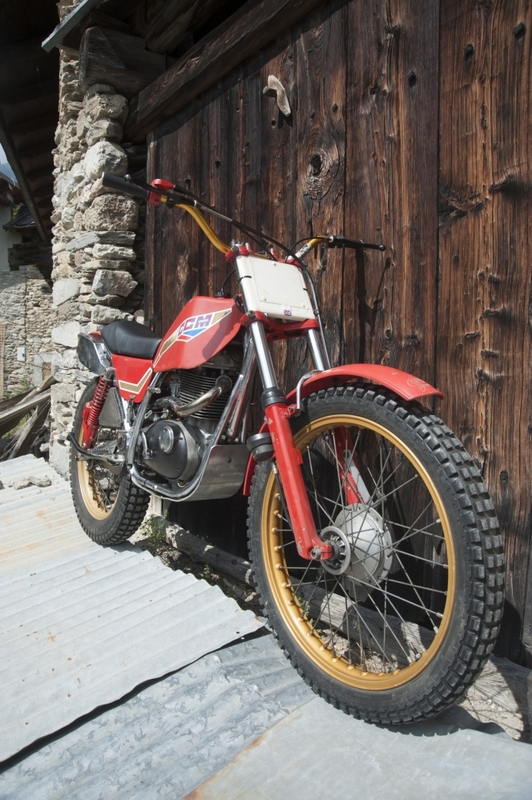 NEWS ABOUT FOUR STROKE TRIALS BIKE EXCITED FOUR STROKE FANS SO MUCH THAT CLEWS ANNOUNCED 100 BIKES TO BE BUILT.AND OF COURSE NICK JEFFERIES WAS RIDER TO COMPETE ON IT AND DEVELOP IT. NICK HAS GOT HIS FIRST PROTOTYPE IN FEBRUARY 1978 HE WAS RATHER DISSAPOINTED, BIKE WAS NOT SATISFACTORY AS HANDLING AND DESPITE 4STROKE POWER IT HAD PROBLEMS WITH TRACTION, ALSO STEERING AND HANDLING SHOULD BE IMPROVED. SOME DIAMENSIONS LIKE STEERING HEAD ANGLE, REAR SWING ARM PROPORTIONS ETC.BIKE WAS AGAIN TESTED BY NICK AND THAN BACK AT FACTORY FOR SOME REFINEMENTS.EVEN ENGINE CAPACITY WAS EXPERIMENTED OF 351 AND 412 JUST TO DICOVER THAT 350 WAS BEST. LIKE, HAS HE HAD HIS ENGINES FROM CCM AVAILABLE? SOURCE HENSHAW CCM BOOK AND VARIOUS MAGAZINES. A better view of the bronze and Argon welded frame. And the Marzocchi "Oleo" rear shocks fitted to the machine. We will see what we can do about the missing "Miller" frame. Justyn Norek Seniors, rendering of his take on the Concept of the Sammy Miller version if it had ever become a production reality. The advertising literature. did they need any they sold by word of mouth fast. but were not profitable for CCM. so they saved the parts for the scrambles bikes instead of making another batch of one hundred. Shame. As you can see it was a good mix of Anglo-Italian parts that made up the machine. and using a very low compression piston in the engine compared with what had been used by the BSA comp shop on their 350 trials engine. All Photos Courtesy Justyn Norek Senior. 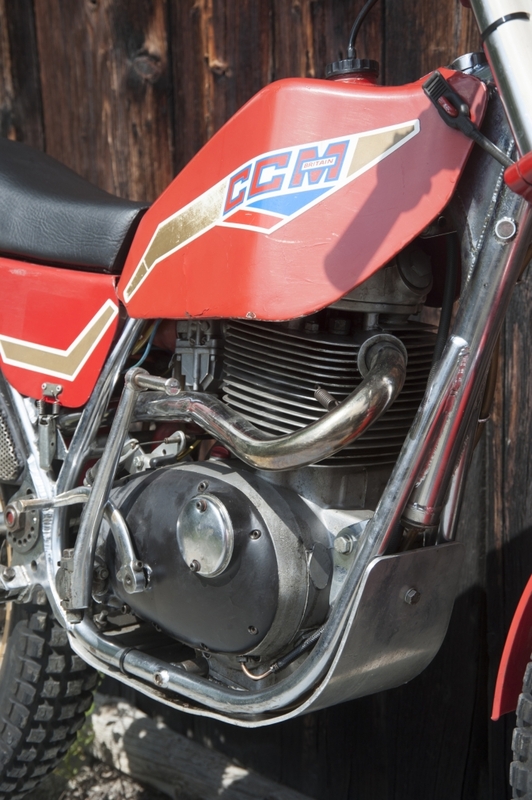 This is Paul Nixon's CCM that started life as a prototype 250 machine from the Factory so I am told. We will get the story later. and try and trace the machines history. We start the story where I have information. Pauls CCM previous owner was Roy Topp's. from Chandlers Ford, in Hampshire. He sold the machine to Paul in 2006. It is not known where Roy bought the machine but the theory is from a bike auto-jumble somewhere. 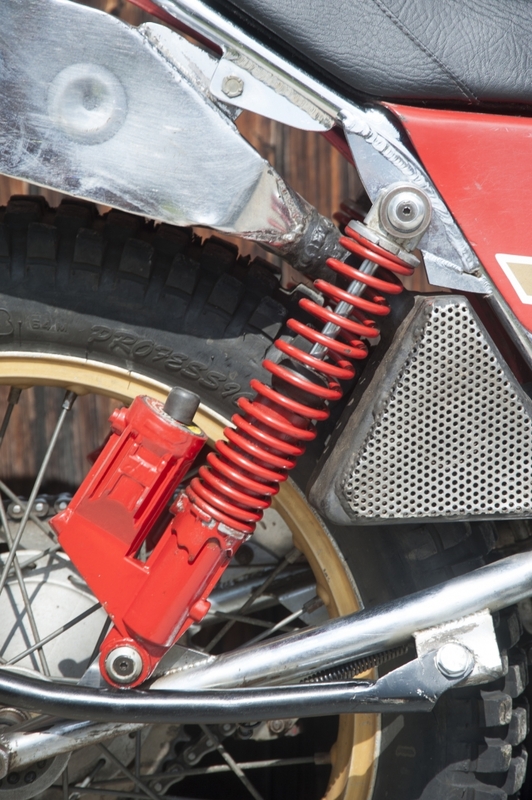 The bike is said to have been tested by Dave Thorpe, at one time. My other theory is that the machine may have passed through the hands of Mike Mills at one time. So If anyone has any information about this bike please contact me so that we can put the story together.